I’m about to state an opinion that some people might not agree with, but here we go: pork isn’t really that good unless it’s slow cooked. There’s just something about the meat that needs the benefit of slow cooking to really sing. That being said, one of my favorite and easiest slow cooked pork recipes is pulled pork. It’s delicious and there are also almost always leftovers to use in different ways. One way I came up with to use up leftovers was to use it in a burrito. While places like Taco Bell don’t usually feature pork, at real Mexican restaurants you’ll generally find at least a few dishes featuring it. So while I’m in no way claiming this is an authentic Mexican dish, it’s not that far out there either. Preheat oven or toaster oven to 300 degrees Fahrenheit. Evenly spread the barbeque sauce on top of the tortilla. 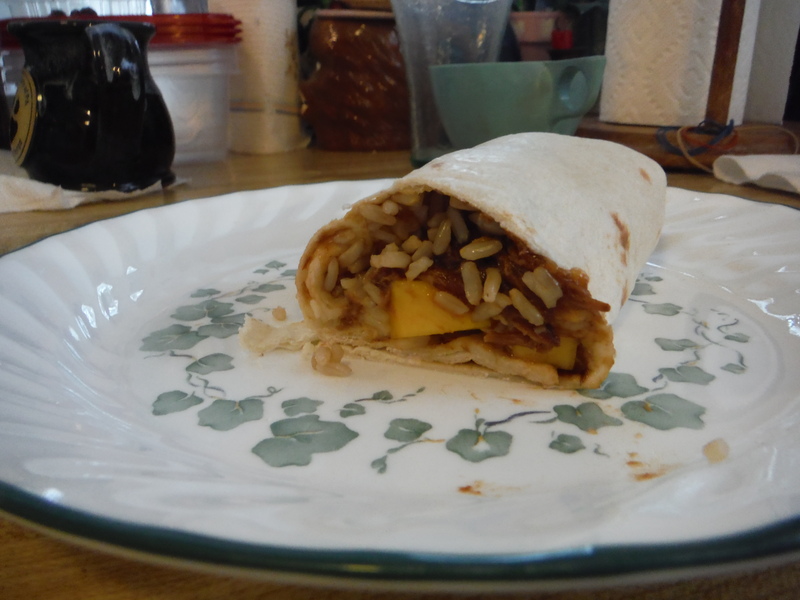 Top with the rice, pulled pork, mango, chilies and cheese. Place in the oven until tortilla softens and cheese melts. Fold into burrito form, eat and enjoy! Need tips on folding your burrito? Watch our tutorial video! Posted on October 7, 2015, in Etcetera and tagged awesome, cheese, easy, mango, pork, recipes, tacos and burritos, yummy. Bookmark the permalink. 1 Comment.